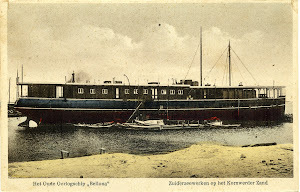 An item reported the launching on 10 July of the motor ocean seagoing tug Flamingo at the Arnhemsche Stoomsleephelling Mij N.V., Arnhem, Netherlands for account of the B.P.M. Fitted out with 1-340hp Werkspoor diesel engine. Was to serve in the Netherlands New Guinea. Dimensions 22 (between perpendiculars)-24,25 (over all) x 5,50 (on thrushes) x 2,70 (hold) metres. The edition dated 12 November 1948 that she executed her successful trial on the Nieuwe Waterweg on 28 October and after her delivery to the Nieuw Guinea Petroleum Maatschappij departing towards Balik-Papan.